Like a guy who remembers the first girl he kissed, I know exactly when and where my fascination with Byrdcliffe carving began. In the late 1980s I came across one of the best books about the Arts & Crafts period, Bruce Johnson’s “The Official Identification and Price Guide to Arts and Crafts: The Early Modernist Movement in American Decorative Arts: 1894-1923”. If you follow the link, snap up one of the used copies. You can thank me later for pointing you toward a comprehensive resource on who was who and who did what in the early 20th century. A few years later I was working in a cabinet shop outside Columbus, Ohio. I did the shop drawings and built the tricky stuff, mainly large reception desks. After a few years of building projects that needed to be lifted off the bench with a forklift I was ripe for something smaller and more creative. I went back to the book and this black and white image set something off and I decided I should learn to carve. 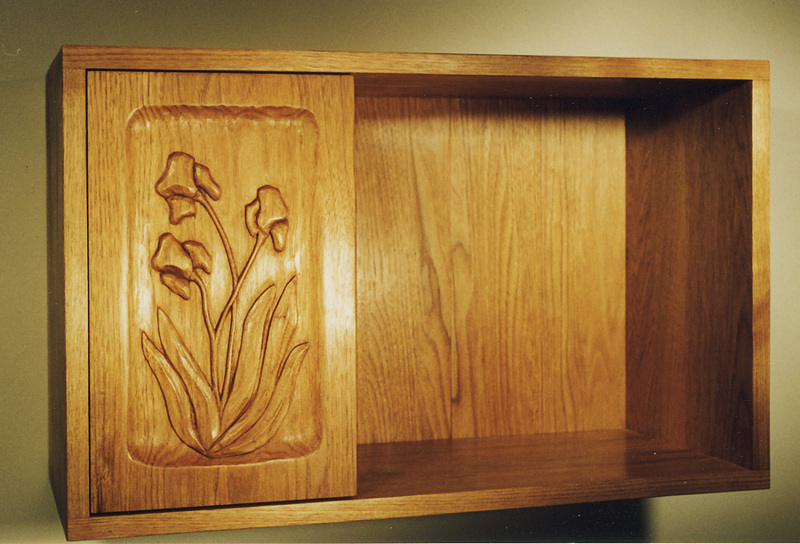 Who knows what would have happened if the image had been in color, but my idea was to make small cabinets that hung on the wall, with a carving on the door. A strict reproduction never crossed my mind, I just liked the form and the addition of the carving. So I started getting up really early and carving for a few hours before work. 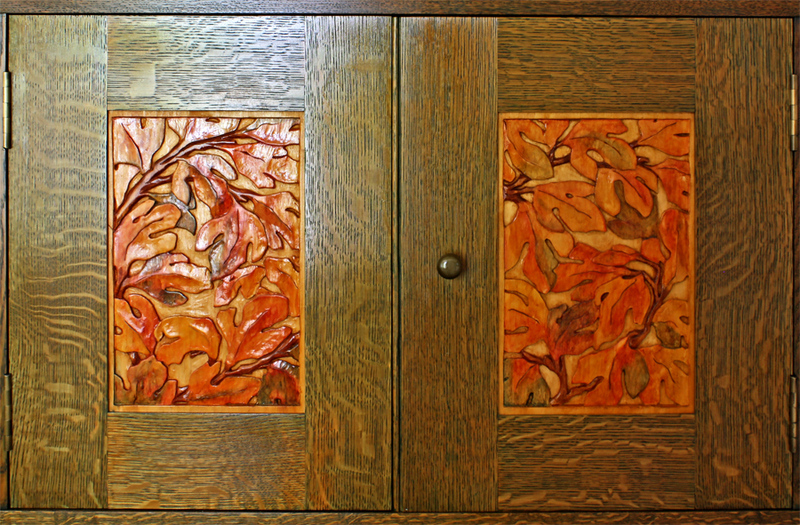 When I felt comfortable about the carving, I built this little cabinet out of butternut. It’s “inspired” by the Byrdcliffe piece, but I changed the proportions. This is the first (and last) time I used the Golden Ratio in a design. I don’t think it worked out, the open area to the right would look better if it were a bit wider, and the entire cabinet is too deep. There is nothing special about the case, it is a dovetailed box with a shiplapped back. There is a french cleat behind the back boards to hang it on the wall. Soss hinges and a touch latch make the door open and close. I drew my own sketch and thought the carving came out pretty good. Fast forward to 2006 and I was working as an editor for Popular Woodworking Magazine. 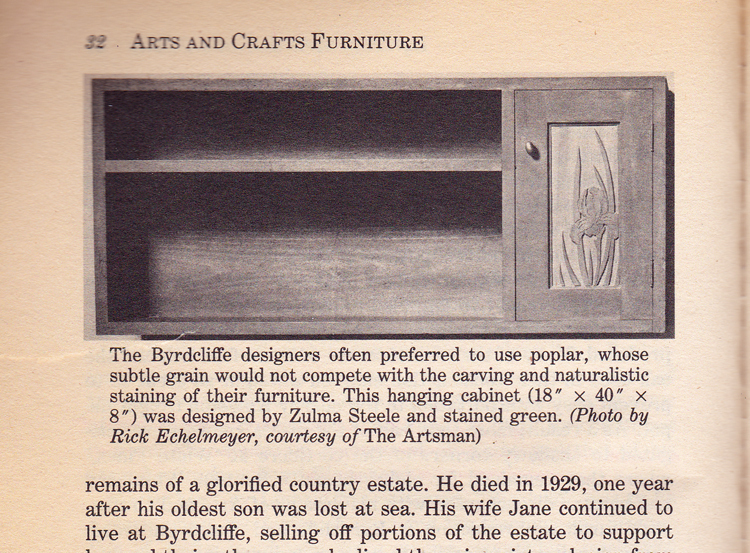 A reproduction of the Byrdcliffe Linen Press made it to our list of projects that no other magazine would publish. To make a long story short I ended up building the piece and carving the doors in addition to researching it and making the drawings. That piece is a close reproduction, although I added more shape to the carvings. The photo at left is of the doors of that piece. It’s one of our favorite pieces. I didn’t think much about Byrdcliffe for the next few years, until the summer of 2012. In a comment to a blog post about an upcoming class, a couple of readers suggested than I teach a class on building the linen press. While I’ve been known to be overly ambitious in selecting projects for classes I teach, I recognized that notion as insane (at least for a one-week class, maybe it could be done in two). But that notion rekindled the Byrdcliffe jones in me and I began thinking about a smaller, more approachable Byrdcliffe piece, perhaps the Iris desk. As I researched the desk I learned that the original piece still existed and the people in charge of taking care of it didn’t mind if I came and took a look. That’s where I also recognized that what I had been calling a fascination is more accurately described as an obsession. 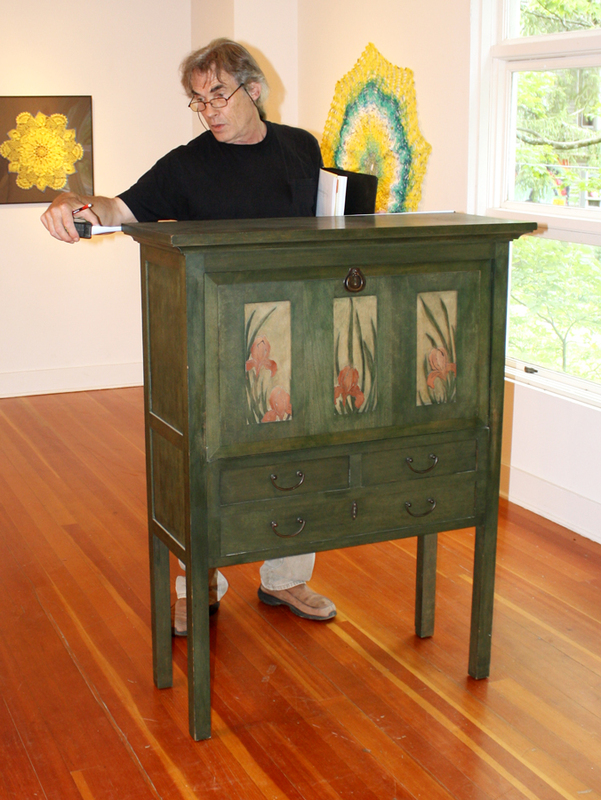 A couple of weeks after reading an innocent suggestion I drove hundreds of miles to see an old piece of furniture. Building the desk is now at the top of my bucket list projects, and as it was when this whole thing started, I figured I better start by practicing on the carved panels. Where do I get the pattern for the relief-carved panels? That should download a PDF file that is full size, printable on legal size paper. I’m working on additional patterns and plans, stay tuned . . .